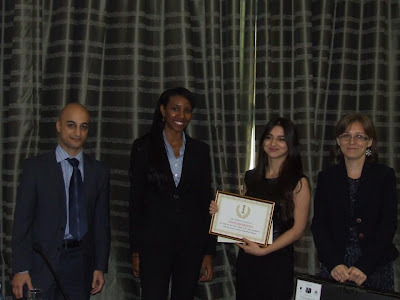 The JRFP aimed at building the social science research capacity among students or recent graduates in Azerbaijan. Competitively-selected program participants participated in a three-stage set of intensive trainings on qualitative and quantitative research methods, including introduction to policy analysis and public policy paper writing. The presenters demonstrated their learned skills and research findings at the conference. During the award presentation ceremony, the top three finalists - Aynur Ramazanova, Nargiz Guliyeva and Shabnam Agayeva - were presented with notebooks. The fourth and fifth finalists--Aysel Aliyeva and Vladimir Rodin - received netbooks. 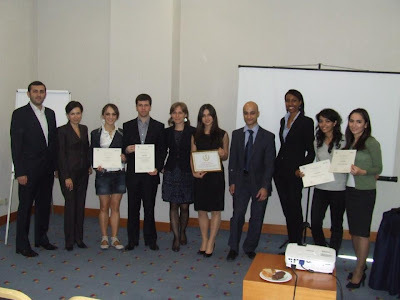 All other participants of the third stage of the program received certificates of participation. The Junior Research Fellowship Program was generously supported by the OSI Think Tank Fund, Budapest.